Relicensing the Hells Canyon Complex started long before 2005 when Idaho Power's license expired to operate its system of hydroelectric dams on the Snake River between Idaho and Oregon, but finding common ground regarding fish passage remains at an impasse. While the two states share a boundary, they are divided on how to interpret the U.S. Clean Water Act. Oregon Department of Environmental Quality wants lower levels of methylmercury than Idaho in fish found downstream of the Brownlee Reservoir. While the U.S. Geological Survey continues its study of methylmercury for Idaho Power, a compound created in oxygen-free environments in the deepest parts of the reservoir, Oregon is taking the lead to include fish passage in the new license, a plan hotly contested by Idaho Power and Idaho's Gov. Butch Otter. For 11 years Idaho Power has submitted and withdrawn applications to both states for certification that would permit them to complete their application process with the Federal Energy Regulatory Commission. As part of the annual licenses that FERC has been granting to operate the dams since 2005, Idaho Power is required to have a pending 401 application in front of the two DEQs. Brad Bowlin, communications specialist for Idaho Power said, "The repeated filing and withdrawing of the 401 is part of the collaborative process that we have been going through with Oregon and Idaho in developing a final certification and an overall license." This summer Idaho Power submitted applications to both Idaho and Oregon and this time they did not withdraw them. On Dec. 13 Oregon released a draft water quality certification kicking off a 60-day comment period. On Dec. 14 Idaho released its draft certification and aligned the cut-off for public comment to match Oregon's deadline of Feb. 13. The major difference between the two drafts - Oregon asks Idaho Power to consider fish passage, allowing for a 13-year study period to determine feasibility. Eric Nigg, East Oregon Water Quality manager for DEQ, said fish passage to the tributaries is in the state's biological criteria for protection of designated beneficial uses. "Having the ability to get to those areas is part of beneficial use," Nigg said. Not only is it important for fish to be able to reach the tributaries to spawn, but anadromous fish, like steelhead and chinook salmon, deliver marine-derived nutrients to the ecosystem when they die. "Those fish are an integral part of a healthy environment," Nigg said. "The ability to get fish to all parts of water bodies is a component of our state water quality standards." "Part of the requirement is to allow passage into Pine Creek," Nigg said. "The study would determine whether or not it is appropriate habitat, how much habitat is available and what productivity to expect," Nigg said. If the study proves that Pine Creek can support the reintroduction of anadromous fish, Nigg said it will be used as a model for other tributaries on the Oregon side of the Snake. Idaho Power is already planning habitat restoration on the Powder and Burnt rivers as part of its Snake River Stewardship Program in order to decrease the water temperature as it enters the Complex. Instream river restoration work is underway at Walters Ferry in southern Idaho and the program calls for riparian restoration on the Powder River in collaboration with private landowners. However, fish passage is out of the question. Idaho Power maintains its fish hatcheries and release of steelhead and chinook downriver of the Complex is sufficient. 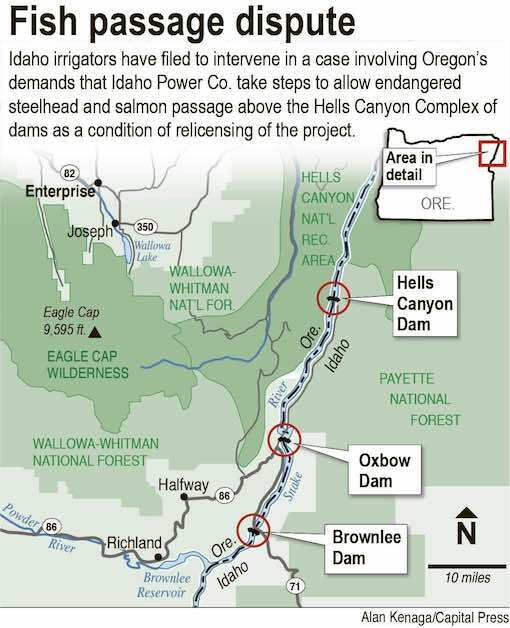 Bowlin said, "Idaho Power is actively engaged in anadromous fish production as part of its mitigation efforts for the Hells Canyon Complex. We survey fall chinook salmon redds in the mainstem Snake and tributaries below Hells Canyon Dam and we operate our facilities there to help maintain suitable nesting conditions until the fry emerge in the spring." Idaho Power owns four fish hatcheries that are operated by the Idaho Department of Fish and Game for the spawning and rearing of chinook and steelhead. Bowlin said, "We trap the adult fish below Hells Canyon Dam and release the young either below the dam or in tributaries of the Snake below Hells Canyon Dam." He said their annual production goals for hatchery-raised fish are 1,000,000 fall chinook, 3,000,000 spring chinook, 1,000,000 summer chinook and 1,800,000 steelhead. The power company's unwillingness to include fish passage was echoed in Idaho Gov. Otter's July 19 letter to Oregon's Gov. Kate Brown. Otter wrote, "While I appreciate Oregon's willingness to limit these reintroductions to Oregon tributaries, the agreement would result in reintroduced fish entering Idaho waters. Such occurrence would violate long-standing Idaho law and policy opposing reintroduction of any species without consent of the Idaho State Legislature and executive branch." Expecting Oregon's draft would still contain language about the Pine Creek experiment and the eventual reintroduction, on Nov. 23 Idaho Power petitioned FERC to issue a declaratory order that the Federal Power Act preempts the fish passage provisions contained in Oregon Revised Statute requiring fish passage because the law includes an exemption in the event of federal preemption. The petition says, "It is important for the Commission, as the agency charged by Congress with the administration of the Federal Power Act, to determine whether the Act preempts the Oregon statute as to the Hells Canyon Complex." In its 28-page petition, Idaho Power asked FERC to issue the order no later than Feb. 1, 12 days before the end of Oregon and Idaho's public comment period on their draft certifications. A public hearing will be held on Oregon's draft certification in Portland at 2 p.m. Jan. 9 at the Portland State Office Building, Suite 1A 800 Northeast Oregon Street, Portland, Oregon 97232. People can also attend and provide comments at the hearing at Pendleton's DEQ office, 800 SE Emigrant, #330 and in Baker City at the Baker County Commission chambers, 1995 Third Street. Send written comments by mail, fax or email to Marilyn Fonseca, hydropower program coordinator, 700 NE Multnomah, Suite 600 Portland, Oregon 97232; fax to 503-229-6037 or email HCC401@deq.state.or.us. All comments are due by 5 p.m. Pacific Standard Time, Monday, Feb. 13. Written comments on Idaho's draft certification are due February 13 at 5 p.m. Mountain Standard Time on DEQ's website, www.deq.idaho.gov; by mail to Barry N. Burnell, DEQ State Office, Water Quality Division, 1410 N. Hilton, Boise, ID 83706 or by email to barry.burnell@deq.idaho.gov.